We hope to see you at the Undergraduate Research Conference in Gender and Women’s Studies this Friday, April 20th! The conference runs from 9:30am to 3:30pm in the Gamble Room, Rush Rhee Library and a full schedule is listed on our website. The conference will showcase a range of scholarship on topics including media and representation, art and identity, campus activism, and community organizing. 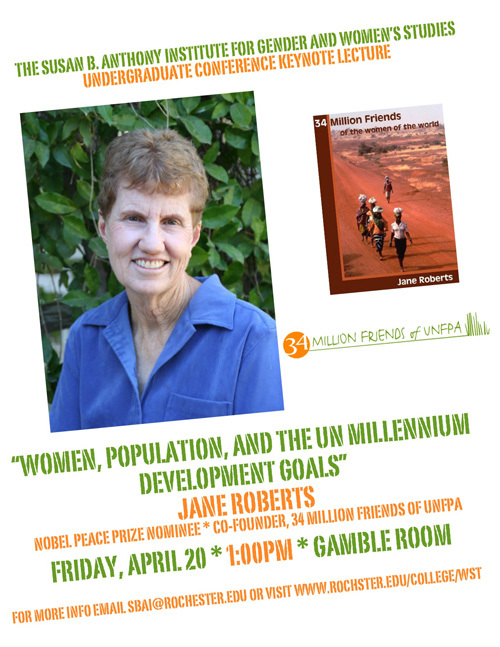 Author and activist Jane Roberts will be giving this year’s conference keynote lecture, “Women, Population, and the U.N. Millennium Development Goals,” at 1pm in the same room. 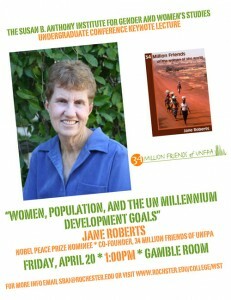 Roberts is the co-founder of 34 Million Friends of the United Nations Populations Fund (UNFPA). The co-founders were honored with a Nobel Peace Prize nomination in 2005. Roberts will join conference presenters and attendees for lunch at 12pm. 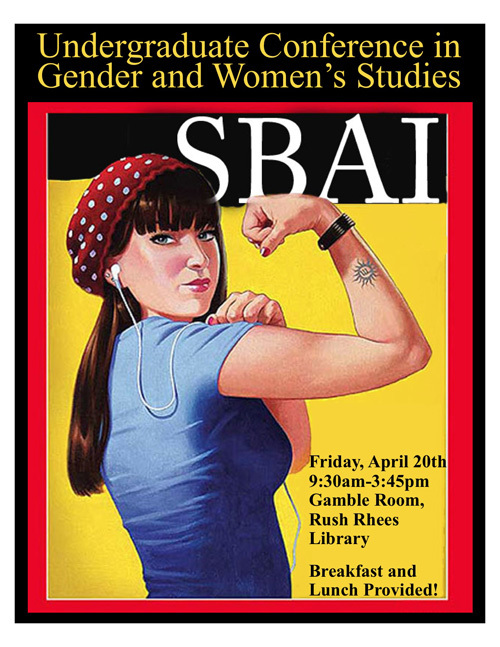 The conference, including lunch with Jane Roberts, is free and open to faculty, students, staff, and community members with an interest in gender and women’s studies. This entry was posted in SBAI Events and tagged #Activism, #conference, #LGBTQIawarenessmonth, #research, #undergraduate. Bookmark the permalink.